For distance runners, injury and health are two sides of the same coin. Healthy runners live in the shadow of injuries past, while trying to avoid one in the future. Injured runners, meanwhile, look on longingly at their former selves, hoping to return to the roads in time. This binary of health and injury is a central part of running culture. There is an entire industry built around it, from advice manuals and foam rollers, to compression socks and dietary supplements. Some of this works and most of it does not. But all of it offers security to the healthy and hope to the injured. Then there is the language used to describe health and injury. Most of this discourse is physical. We use words like "biomechanics." An injury might be the result of some sort of quirk in the stride, an imbalance that results in this problem or that. I always find these explanations to be entirely unsatisfying. I'm injured right now (sniff). And the diagnosis of "biomechanical flaw" just isn't cutting it. 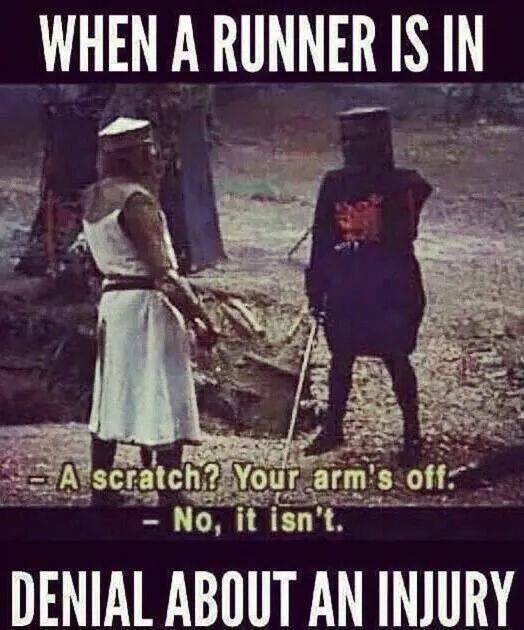 I prefer to think of this running injury as the result of sin. Of two sins, actually: pride and greed. Back in September, I finished a marathon after over a year of injury-free running. I was feeling pretty good about myself. Kinda invincible, actually. Maybe all of those previous injuries were behind me. TAKE THAT AGING! So I shortened my post-marathon recovery. I signed up for a spring marathon. And I did a few runs and workouts that were longer and more intense than they needed to be. TAKE THAT PHYSICAL LIMITS! Pride and greed are indeed "deadly sins" in distance running. In Saint Augustine's formulation, pride is where sin starts, the willing disregard of divine truths in favor of one's own interests. Greed, then, grows out of pride, as "the root of all evil," which happens when we "go beyond that which suffices." Augustine illustrated this by calling to mind the image of Adam, "grasping" for more, even though he had everything. It strikes me that I was, this fall, grasping for more miles, grasping for faster times, and, ultimately, grasping for a body that I don't have. But things are starting to feel better now. I even ran a few miles this morning--even though I promised myself that I'd take another week off. Pride and greed again? I'm hopeless. Save me, Coach Augustine!